At B&M, we're getting very excited for Christmas. But for millions of children up and down the country, Christmas is a difficult time of year. The festive pinch sees struggling families unable to afford the cost of Christmas, and for the 1 in 3 children living in poverty in the UK, presents are a luxury their parents can't afford. Which is why we're once again backing the Cash for Kids Mission Christmas campaign. Last year the charity's annual toy appeal generated more than £23 million in gifts and donations which were distributed to over 709,000 kids. We've set up drop-off points in a selection of our stores across the country. All you have to do is pick up an extra gift during your Christmas shopping and donate it at your nearest participating B&M store. 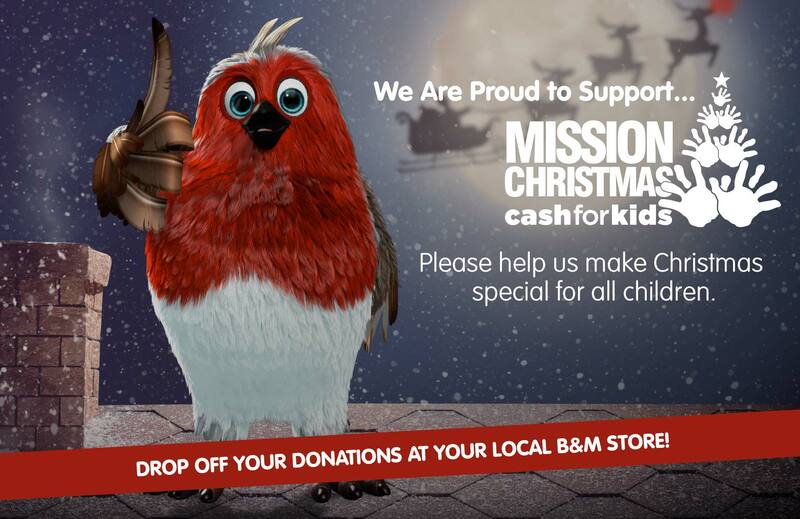 If you'd like to make a donation and help put a smile on a child's face this Christmas, find your local area radio station website below to check where your nearest B&M drop-off point is. Can't find a participating B&M store near you? Don't worry, you can still donate. Click here to find your local radio station which will help you find your nearest drop-off point. Or if you'd prefer to donate cash, you can text MISSION to 70808 to make a £5* donation to the appeal. *see Cash for Kids for full terms and conditions. B&M Retail Ltd is not responsible for the processing of donations.